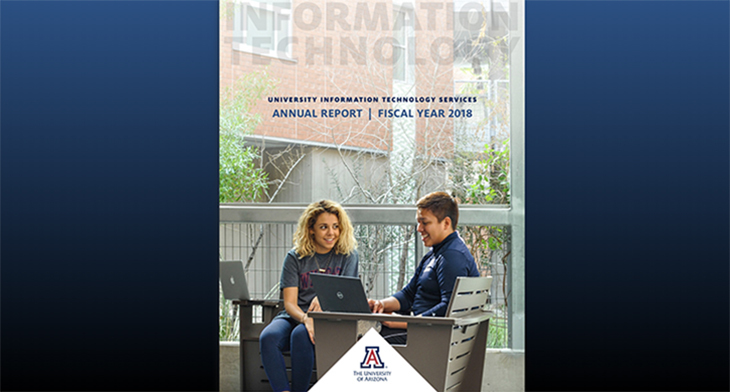 The Annual Report for University Information Technology Services’ initiatives and activity during fiscal year 2018 is now available online. Information technology and the people behind it are integral to the University of Arizona’s teaching, research, service, and business activities. With dedicated executive leadership for our constituent units, we are focused on our campus constituents and their unique IT needs. Find out what accomplishments UITS and campus partners achieved in 2017-18. You’ll learn more about UITS services, see the budget, and find out how we compare to peer institutions. UITS has more projects currently underway and on the horizon, including key involvement in the new UA Strategic Plan. We look forward to working with our campus partners to achieve 2018-19 goals.